It seems that Xiaomi is all set to launch its next flagship at its May 31 event. Its name will likely be changed from Mi 7 to Mi 8 to mark the 8th anniversary of the company. 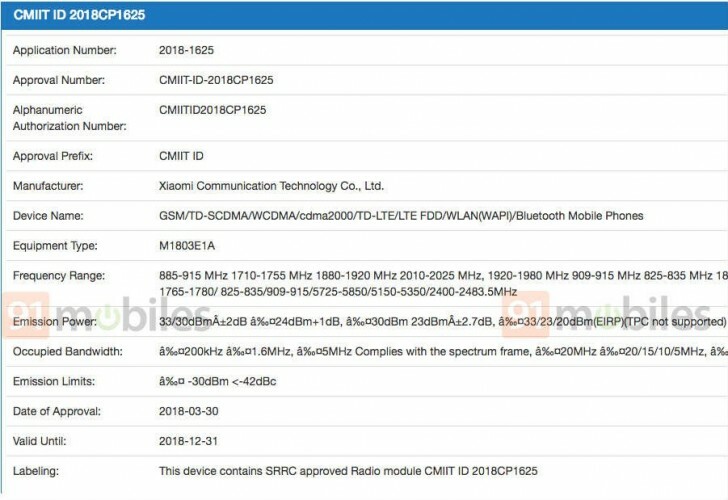 And two versions of the phone were spotted on China's 3C and the US FCC's certification websites. The 3C listing doesn't give away too much information except model numbers, M1805E2A and M1803E1A and support for 5V3A / 9V2A / 12V1.5A charging (up to 18W). The FCC report is even less helpful for filling in blanks in specs we have, so we still have to rely on rumors exclusively. According to previous reports the Mi 8 should come with 3D face recognition - probably similar to Apple's tech in the iPhone X - and in-display fingerprint reader like the one in the vivo X21 UD. Of course, Snapdragon 845 will be on board, while the battery capacity is believed to be 4,000 mAh. Of course some of those reports might not have been too accurate for one reason or another so don't take anything for granted until more solid evidence piles up.